We are family owned and operated in Castle Rock, Colorado. We are your premiere team of heating, ventilation and air conditioning specialists. We serve residential and commercial customers in and around the South Metro Denver area including Castle Rock, Elizabeth, Parker, Littleton, Centennial, Highlands Ranch, and surrounding areas. 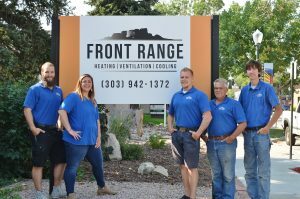 Our team at Front Range HVAC works hard to serve the community based on our core principles and provide knowledge-based solutions to our customers. Our desire is to develop a relationship with every customer and always provide up-front pricing that reflects your budget. At Front Range HVAC, your satisfaction is always a top priority. Our core principles of honesty, integrity, ingenuity, innovation and excellence means that our team of certified HVAC professionals will work hard to find the best solution for your home’s comfort control. Our NATE certified technicians are committed to educating you as the customer, answering any questions you have, and advising you in making the best decision for your home’s system. Designed to provide exceptional indoor air quality and thermal comfort, HVAC systems are complex networks that manage the air you breathe and the temperature throughout your living space, year round. We believe in sustaining environmentally friendly products, and keeping you educated about the operations and functionality of your home’s comfort control system. With every install or repair, you will receive a detailed maintenance checklist that keeps you informed about the comprehensive operation of your system and assists you with future repairs or replacements.